Electronic Waste (ewaste) recycling is more than just reusing materials. Recycling ewaste not only diverts toxic metals from landfill but it also means many valuable materials can be reused. Recycling reduces the amount of waste as well as the mining of raw materials – in essence recycling is “above ground mining”. There is a massive energy saving when creating secondary raw materials compared to primary raw materials. For example, recycling steel into a secondary raw material uses 74% less energy than the production of the primary product. Recycled Aluminium uses 95% less, Copper 85% less, Lead 65% less and Plastics 80% less – it’s a win, win, win scenario – we protect precious resources, divert usable materials from landfill and conserve energy all at the same time! We’ve been recycling products in one way or another for thousands of years, it’s just that in recent decades the concept of ‘disposable goods’ has reached all time highs and the topic of ‘conservation’ is paramount. What is new is the need to adapt recycling methods and behaviours to keep up with our lifestyles and technological advancements. 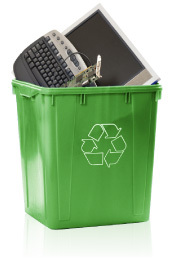 At 1800ewaste we are passionate about diverting as much electronic equipment from landfill and export as possible. We believe in prolonging the lifespan of valuable materials by recycling all that we can, currently 95-98%, by weight, of all the materials we collect are recycled. Our service is professional, fast and reliable, we’ll come to you, collect your ewaste and deliver it to the appropriate recycling facility.